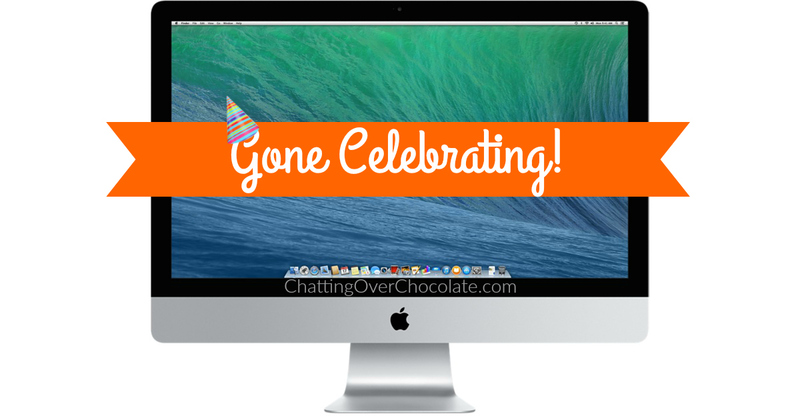 Chatting Over Chocolate: Gone Celebrating! Happy Friday, friends! By the time you're reading this we're likely on the road returning home from a fun family getaway to the Iowa Great Lakes in celebration of my husband Jason's birthday! Being that TODAY is my hubby's birthday, please excuse me while I gush over his awesomeness a bit! ;) I am so incredibly grateful, beyond what any words could begin to fully express, to God for blessing me with such an incredible husband and daddy to my girls! He is so strong, yet gentle, hardworking and humble, courageous, and has such a depth of character and integrity I've not seen in another living soul! He loves me exactly as I am, flaws and all, and lavishes love, grace, and support on myself and our family at every given opportunity! He enables me to live my dream of being a full time homemaker, wife, and mother. Furthermore, sees the work I do in our home as important as the work he does in his career (which I know is extremely rare in our society)! He's the very best friend I have in life, and he has my whole heart! I praise God for blessing him with another year of life and for all the joy as well as trials, that we've grown through during it! Wishing you all a wonderful weekend ahead, friends! We have some more celebrating to do and I can hardly wait! I love the way you love your Mr. That is truly inspirational! I hope he had a fabulous birthday and you had an amazing trip! I toast to both of you lovelies! HAPPY Birthday to Jason!!!! I hope you are all enjoying a FABULOUS day at the lake! Love you all bunches! Happy Birthday Hubby!! Hope you enjoyed every second of your time!! You are blessed! Hope your getaway was amazing! I hope y'all had the best time and that he had an amazing birthday. Can't wait to hear more about your trip!